With a 113-102 victory against the Brooklyn Nets, the Atlanta Hawks have improved to 17 consecutive wins, and with every one of them look more and more like a team to be taken very seriously come the playoffs and not just a regular season fad. Once again the entire starting five scored in double figures. Paul Millsap finished with a very impressive double double of 28 points and 15 rebounds, Al Horford had himself a double double as well of 20 points and 10 rebounds, Kyle Korver was very difficult to stop with 17 points including 5-of-8 from beyond the arc and Jeff Teague produced the third double double for the Hawks on the day, scoring 13 points to go with 11 assists. The Nets had Joe Johnson, the former Hawks player, lead them with 26 points, but in general the Nets are sinking fast. Not that it’s any surprise considering their roster, but Lionel Hollins seems to be disappointing his bosses, who actually thought this season was going to be any different. But hey, not everyone in the East are the Atlanta Hawks, and 18-27 is a pretty good record on right side of the NBA, the easier side. With a winning percentage of 82.6%, they’re on pace to have the best record in history for a team that finished below .500 in the previous season. The only team to post a win percentage of .800 or better after finishing below .500 the season before were the 2007-08 Celtics (80.5%). Boston won the title that season after beating the Lakers in the NBA Finals. 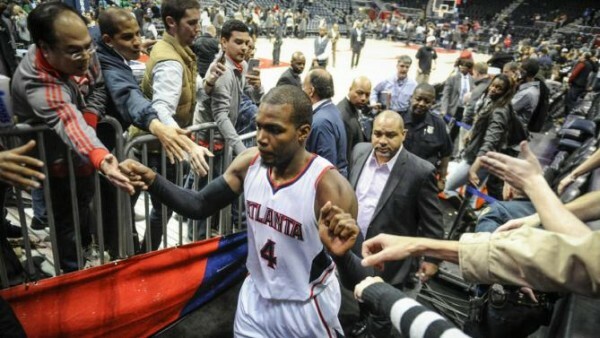 The Hawks have never gotten past the conference finals since moving to Atlanta. Even more impressive is the Hawks already equaling their win total from last season (38-44). They were dead smack in the middle of the pack last season in both offensive and defensive efficiency, but are up to fifth on offense this season and 4th on defense. Kyle Korver is on pace to set a special mark of his own. The famous 50-40-90 mark? He’s on pace to have a 50-50-90 season, hitting 51.8% of his field goal attempts, 53.4% of his shots from beyond the arc and 92.3% from the line while averaging 13 points per game, his highest since the 2006-2007 season. It’s amazing what the right coach and the right system can do to a player with a very limited skill set.